Pilot Andre Borschberg successfully had launched the plane from an airfield in Payerne in western Switzerland at around 8:30am (0630 GMT) Thursday, bound for Rabat via Madrid, after a two-hour delay due to foggy conditions. If successful the 2,500-kilometre (1,550-mile) journey will be the longest to date for the craft after an inaugural flight to Paris and Brussels last year. Borschberg landed the plane in the Spanish capital in the early hours of Friday and emerged smiling from the cockpit. 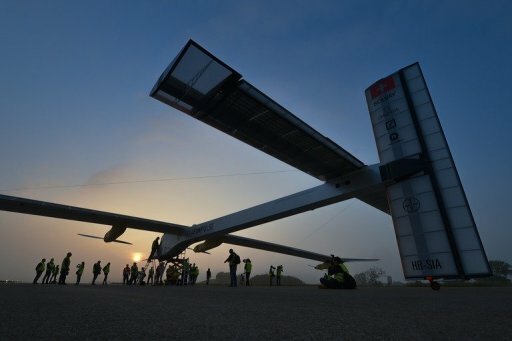 "The flight went very well and thanks to the team of meteorologists, everything went according to the plan: it was extraordinary" he said upon arrival for what is expected to be a three-day technical stopover. "It was incredible to fly alongside the barrier of clouds during most of the flight and not need to hesitate to fly above them. This confirms our confidence in the capacity of solar energy even further," he added. The high-tech aircraft, which has the wingspan of a large airliner but weighs no more than a saloon car, is fitted with 12,000 solar cells feeding four electric engines. The trip is intended as a rehearsal in the run-up to the plane's round-the-world flight planned for 2014. The aircraft made history in July 2010 as the first manned plane to fly around the clock on the sun's energy.